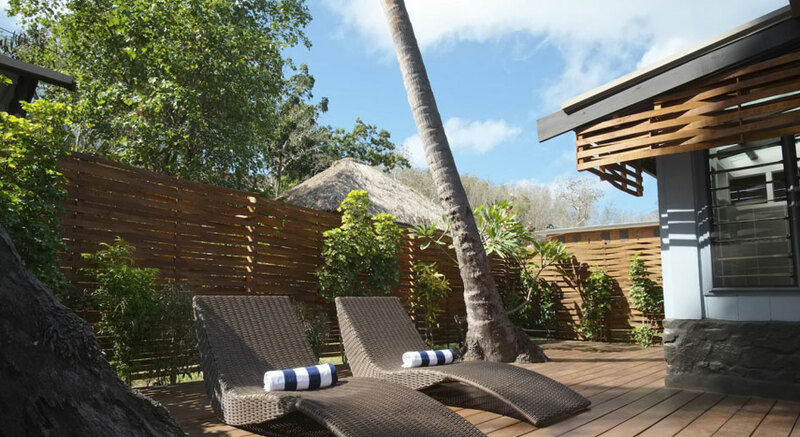 Nanuya Island Resort is located on a picturesque landscape in the Yasawa Islands, Nanuya Island Resort is the perfect place to escape and simply embrace the island lifestyle of enjoying each moment at a leisurely pace. Be cared for by friendly staff and feel the warmth and genuine Fijian hospitality while enjoying the comforts of your fan cooled accommodation. Relax on one of the finest beaches in the South Pacific and let the warm climate ease away your cares. Enjoy the turquoise waters and explore the spectacular marine life. If you are feeling adventurous, you can kayak around the island or go on a diving trip with the qualified and knowledgeable dive team. Before or after a day of leisure, a rejuvenating massage will always do the trick. Treat yourself to an island cocktail and indulge your taste buds in the blend of cuisine. So for that perfect romantic or family retreat, come and experience this slice of heaven on earth. The Treetop Bure are situated along the hillside among tropical flora, the traditional bure offers breathtaking view of the lagoon. Along with a ceiling fan, louvered windows allow the cool breeze into the bure keeping it cool and well ventilated in the tropical warmth. The bure has private bathroom facilities with hot and cold running water, coffee and tea making facilities, mini fridge and mini safe. Towels, complimentary shampoo, conditioner and bathing soap are also provided. Mosquito nets and electric plug mosquito deterrent are available in the bure if required. The traditional treetop bure can accommodate up to 2 guests with either a double or twin bedding configuration. The Deluxe Villas are surrounded by swaying palm trees and tropical flora, the deluxe villa is only a few steps away from the beach. Including a hammock right outside your doorstep, the villa has en-suite bathroom facilities with hot and cold water, coffee and tea making facilities, a mini fridge, mini safe, towels, complimentary shampoo and conditioner and bathing soap. The deluxe villa can accommodate up to 4 guests with a queen bed and 2 x single beds. Head to Fiji, the land of sun and tropical settings set in lush greenery. Take a Fiji tour that will take you beyond the beautiful white sand beaches and into the heart and soul of Fiji! There are numerous exciting things to see and do in this island paradise. Some of the activities offered at Nanuya Island Resort are hobie cat sailing, scuba diving, snorkeling, hand line fishing and more! Children over the age of 7 are permitted at the resort at any time of the year.